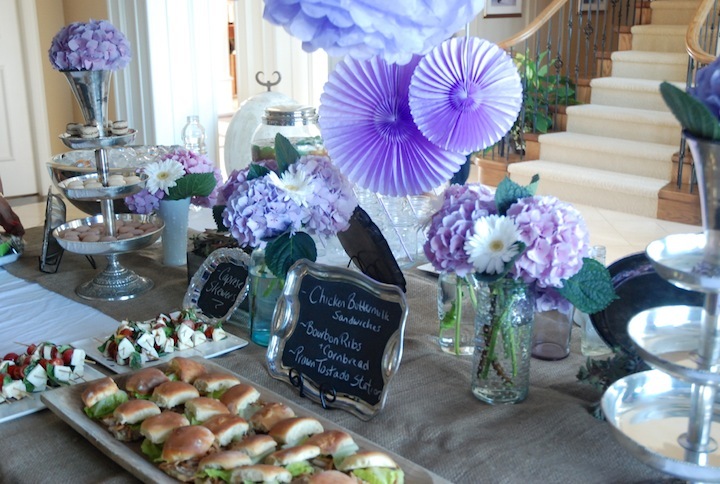 Pam and i had the pleasure of helping our Sugar Plum Mom plan a bridal shower for our cousin’s wife-to-be. We had a hoot putting together an evening that we hoped would reflect the guest of honour and make her feel treated and special, as she well deserved! Bailey is a horse lover…in fact that’s how she spends her days…teaching others how to ride these gentle giants. This was a great jump off point for us! 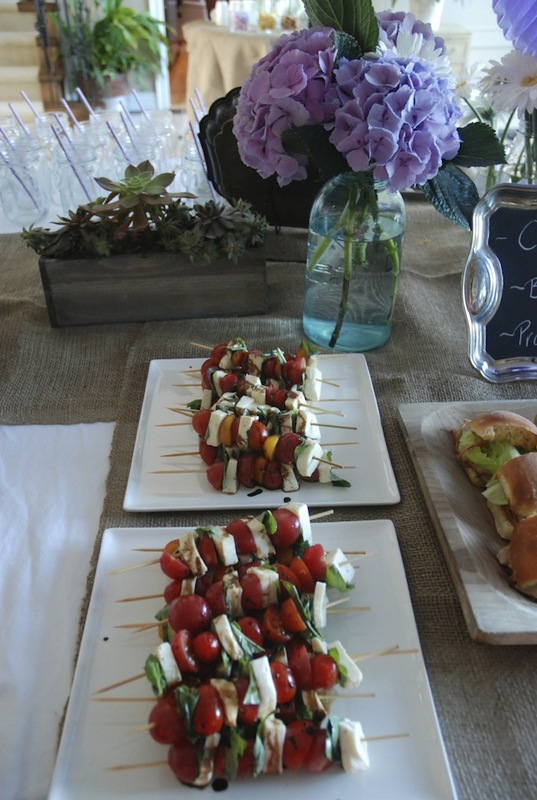 Vintage trays with chalkboard painted interiors work fabulously for messages, as well as giving the details on the food table. Look for trays at second hand/thrift stores! 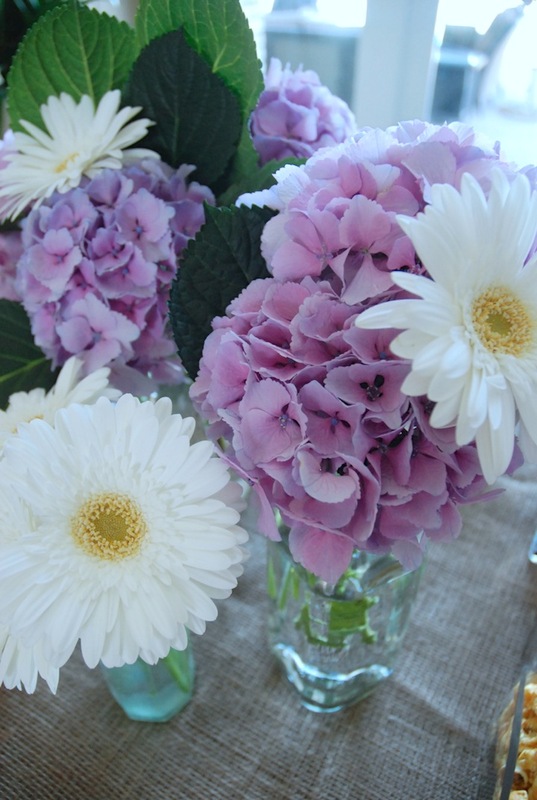 Choosing seasonal flowers, we filled vintage vases and jars with lavender hydrangeas and white gerber daises. Hydrangeas are a personal favourite to use in centrepieces…not only do i love their appearance but their large blooms give a full and lush look in simple arrangements. 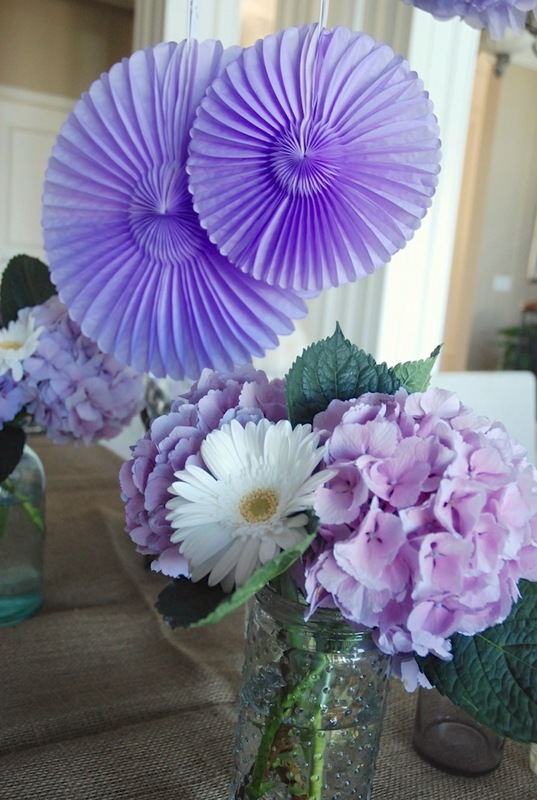 You don’t need a ton of flowers to have a beautiful impact. 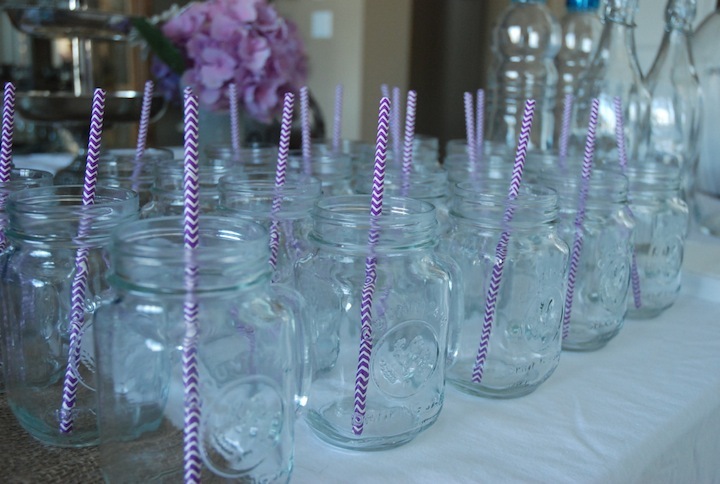 The ever loved mason jars…adding purple chevron straws from Delish General Store made then cute as ever! Because we were just arriving home from our dad’s retirement celebration in Vancouver the evening before, we knew we would be squeezed for time when it came to prepping food. 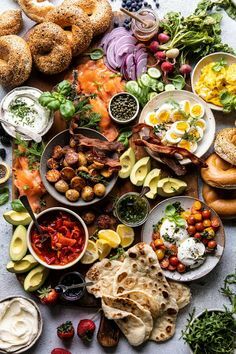 Having Sean Bone, a fantastically talented private chef, take care of the food was a real treat…both in saving time AND indulging in his finished products! 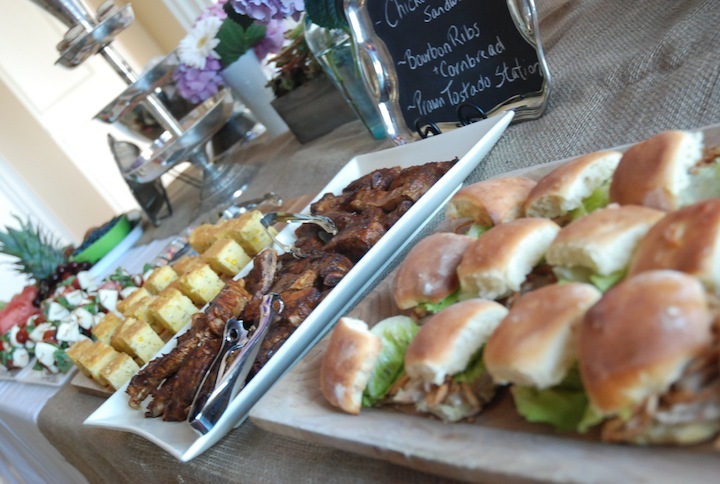 Again, keeping the rustic vibe, we opted for earthy foods… bourbon ribs and cornbread, buttermilk chicken sandwiches, tomato, basil and mozzarella skewers and more. 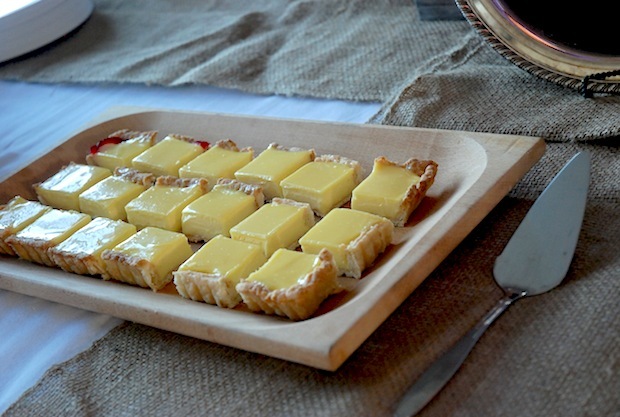 For dessert, a rustic lemon tart as well as the cutest mini lavender chocolate pot de cremes filled our bellies!!! Honestly how can a dessert be cute? 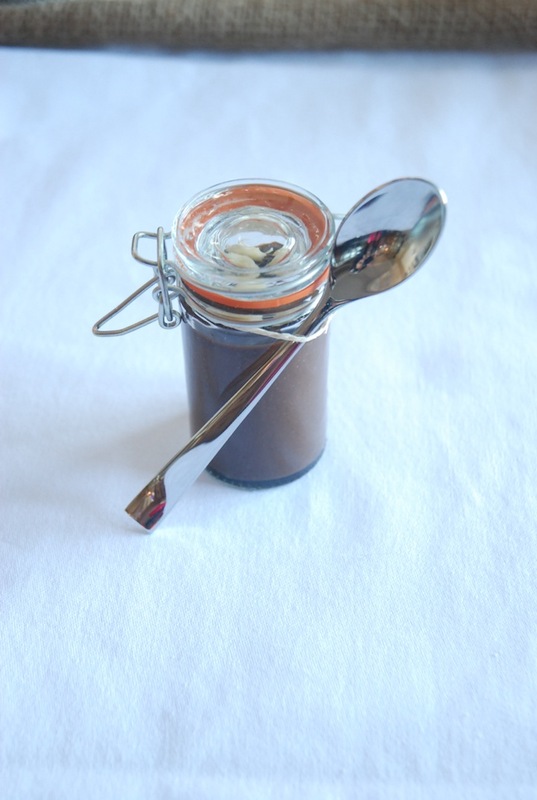 Serve it in a miniature mason jar and you got it…CUTE! 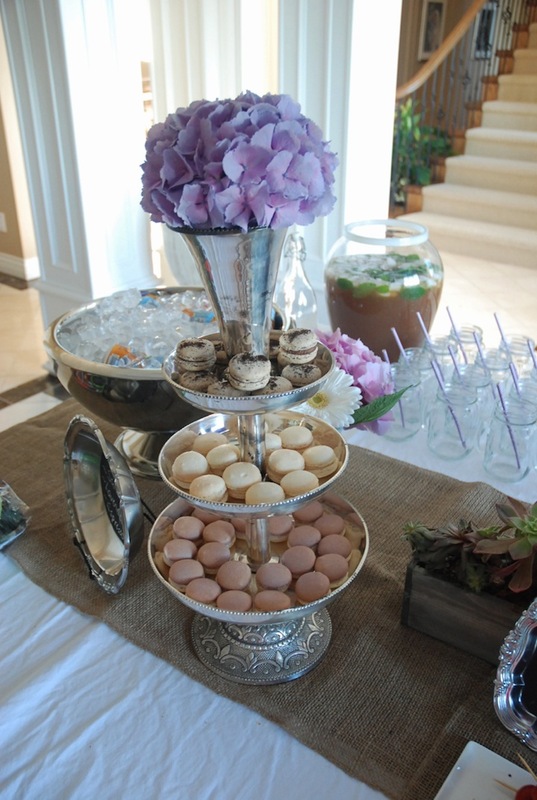 As always, customized sugar cookies by Pam MacGregor (Pam’s Cookies) add a touch of personalization to every party. 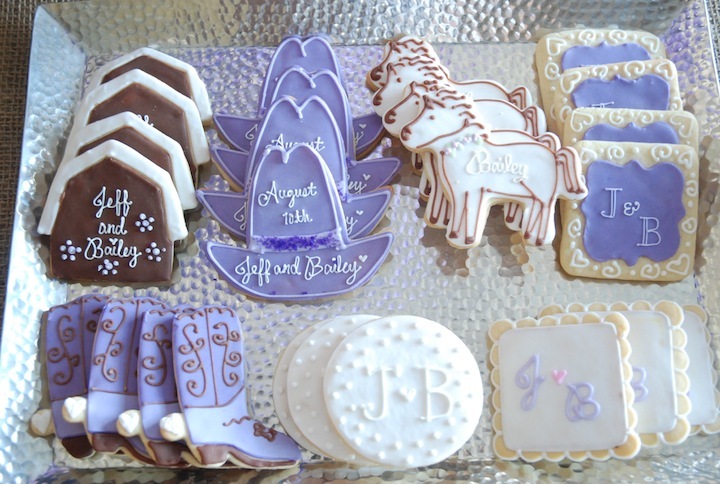 Not only that, they are the best darn sugar cookies out there…they ain’t there to just look pretty! 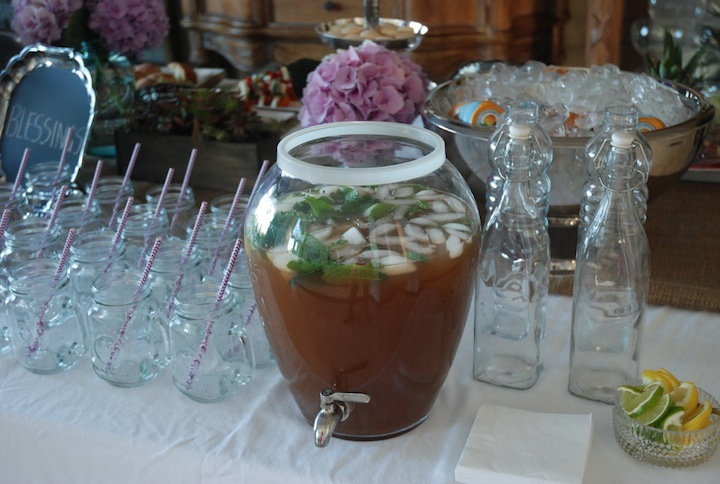 If you’ve seen any of the parties Pam and i have helped plan, you’ll know that we don’t like our guests to leave empty handed…this evening was no different! 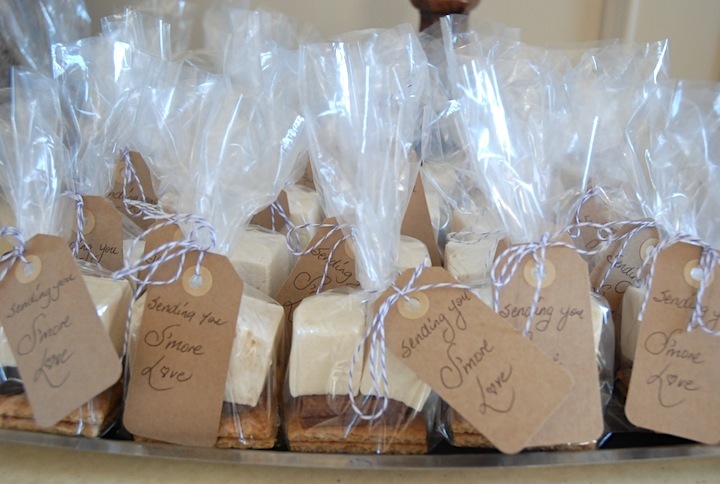 Little packets with graham wafers, chocolate and gourmet marshmallows (Pink Spatula is the best!) with the sentiment “Sending you S’more love” would give them a chance to remember the happy couple while making their s’mores. 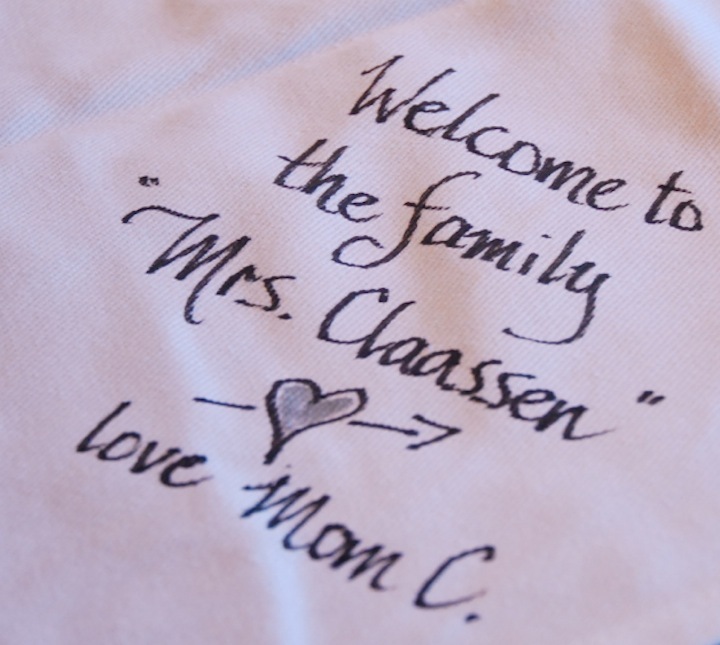 The mother of the groom lent us her exquisite handwriting by writing these tags for us…this take home gift would definitely not have looked so pretty without her help! 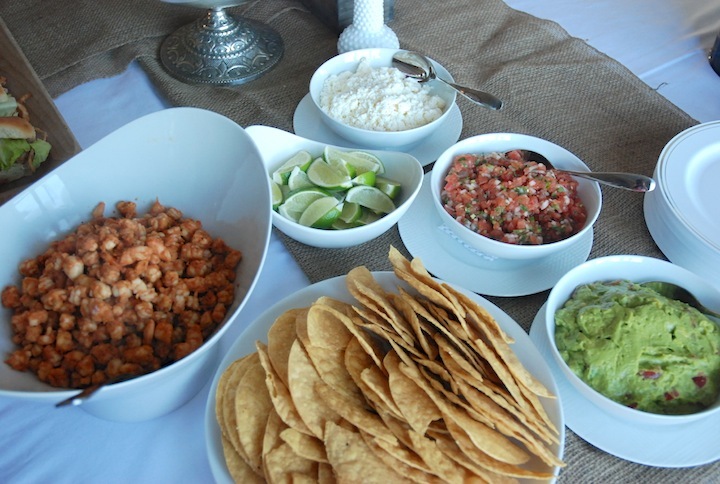 Forgoing bridal shower games…let’s be honest…they are at best cheesy (don’t be hating me for speaking the truth! 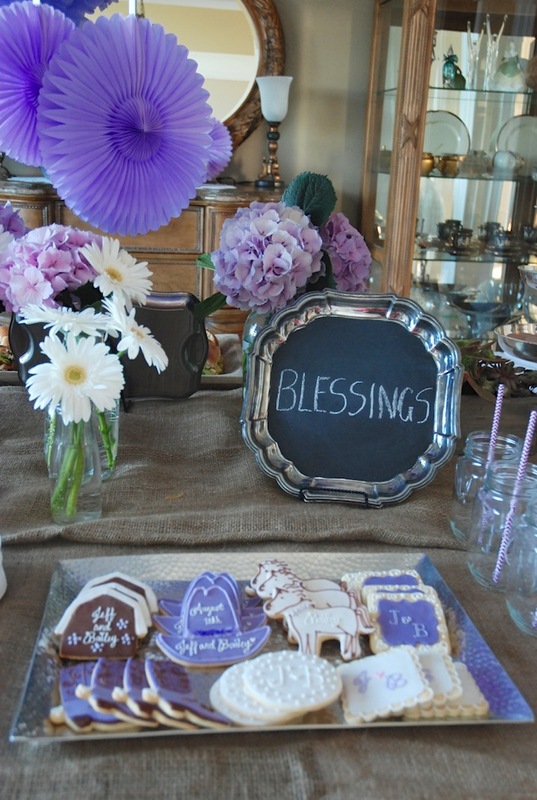 ), our sis-in-law brought an apron that could be filled with well wishes for all who came. We loved the idea!